RACE MTN. TREE 3RD ANNUAL CAREER DAY! From left to right: Ronald Yaple, Nicholas Brazee, Rich Cartier, Marcie Carpenter & Kieran Yaple. Kieran Yaple demonstrates throw line. Marco Benitez demonstrates different chainsaw cuts. Dr. Nicholas Brazee performs a tomography demonstration. Donovan Baisley & Marcie Carpenter ran the Limb Walk station. 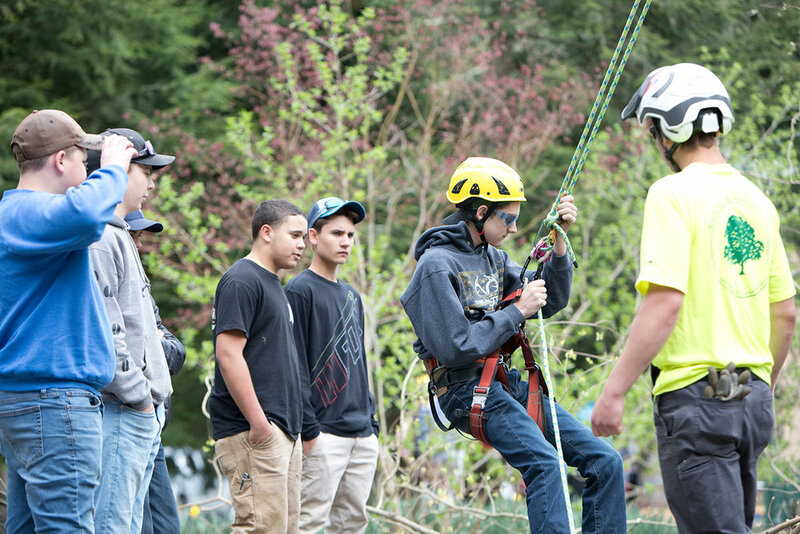 Annually Race Mountain hosts an interactive career day for 4-5 local high schools. 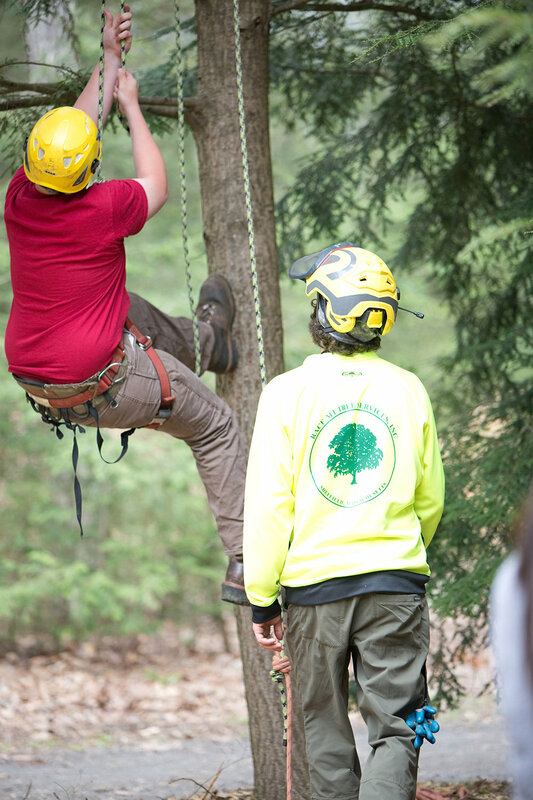 We incorporate educational talks with interactive demos for the students to participate in with local experts in the Arboriculture & Pest management fields. This year we had some excellent speakers join us! Ron Yaple started the day with introductions to the Race Mtn. Staff and the speakers as well as a general overview of his journey into Arboriculture, owning & operating Race Mtn. for 40+ years, and his transition into Consulting. Next we learned about career opportunities in Plant Health Care by Rich Cartier of Rainbow Tree Care Science. 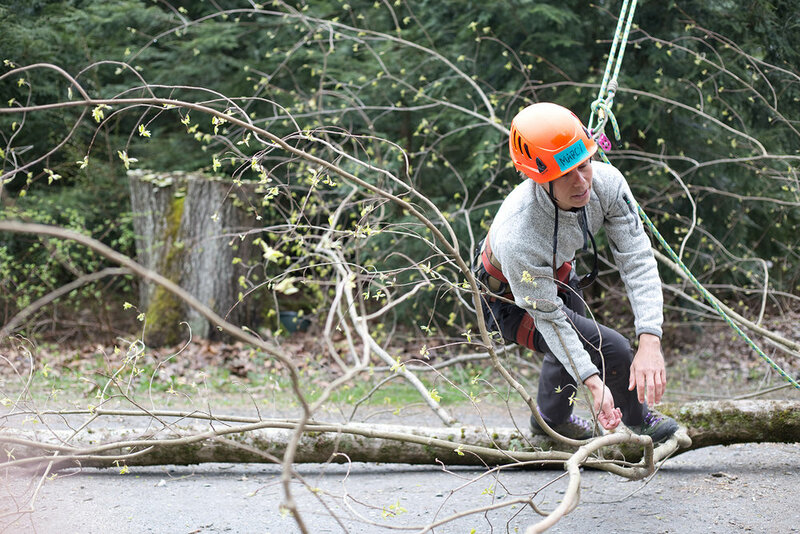 Rich is the territory Arborist for the New England district and Race Mtn. 's plant health care salesman & consultant. 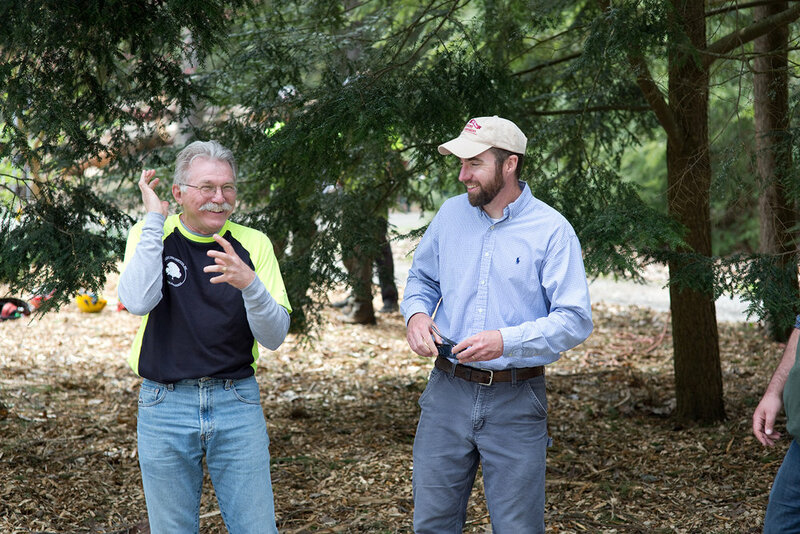 Rich discussed the career opportunities, day to day operations, and salary perspectives for plant health care positions in the field of Arboriculture & its importance in maintaining the health & sustainability of trees & shrubs. Dr. Nicholas Brazee of Umass Amherst discussed his work as a Plant Pathologist and his research on fungal pathogens of trees; he also discussed detecting internal decay in living trees using tomography which he demonstrated throughout the day. Finally, we heard from Marcie Carpenter of Arbor One Inc. regarding the day to day operations of a tree company and her transition to consulting. Marcie also discussed the importance of safety training and standards in our industry and spoke about the safety training program her & her husband Ed run. Rich Cartier & the Race Mtn. Plant Health Care technician Michael Schmidt performed an Ash injection demonstration. Marco Benitez, a climber for Race Mtn. performed chain saw demo & safety; showed the students how to make proper cuts and use chainsaws effectively & safety. Donovan Baisley, a ground crew member for Race Mtn. & Marcie Carpenter performed a limb walk demonstration. Nathan Redman, a Branch Manager for Race Mtn. helped students learn the basics of climbing and helped the students get into saddles & try it themselves. Kieran Yaple, crew leader & CTSP for Race Mtn. 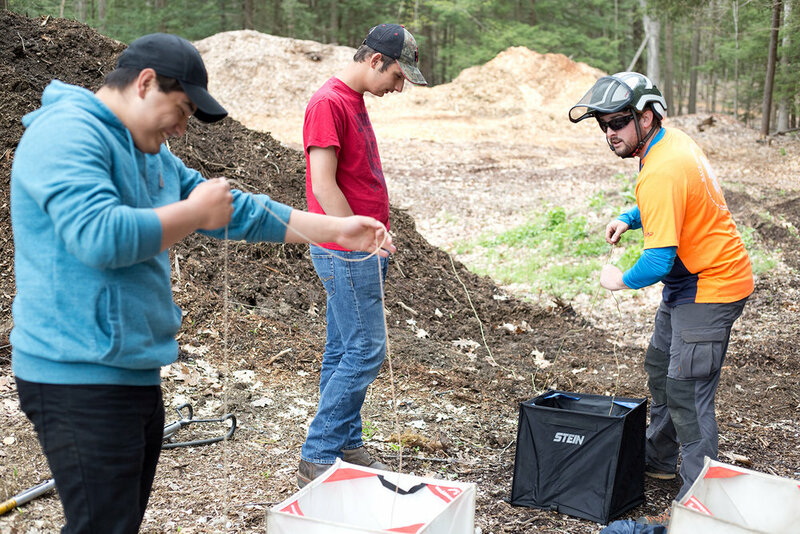 showed students how to use throw line mechanism of various kinds and helped the students use the systems. 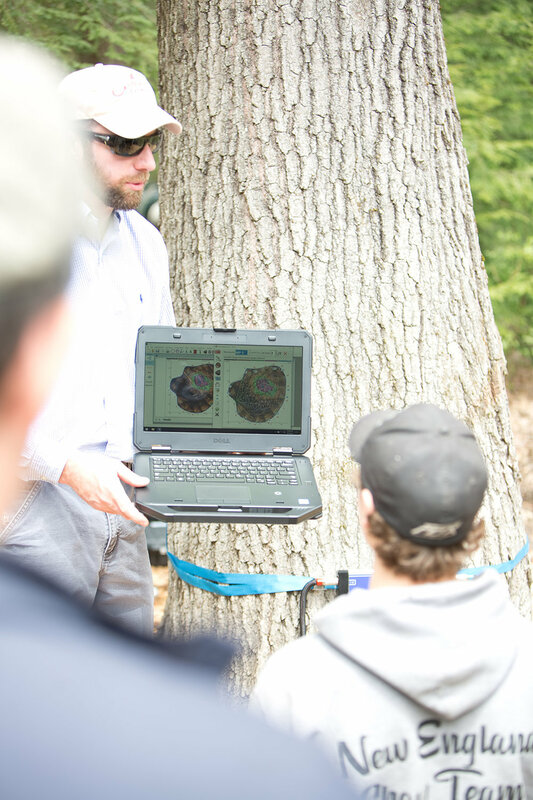 Dr. Nathan Brazee performed a tomography demo to show the students how to determine the health of a tree using his technology & equipment. At the end of the day, Marcie Carpenter performed a foot-locking demo which was mighty impressive! Throughout the day students interacted with our experts and Race Mtn. crew members asking questions, inquiring about future employment opportunities in the field, enjoyed a pizza & cookie lunch, and participated in a raffle draw for goodie prizes provide by a series of industry leaders. THANK YOU TO ALL THE TEACHERS, STUDENTS, AND GUIDANCE COUNSELORS THAT CONTINUE TO SUPPORT OUR CAREER DAYS EVERY YEAR. THANK YOU! To our WONDERFUL photographer AMY INGLIS for all the wonderful moments you capture of our work, fun times, and projects!